It’s not Big. And it’s not clever. Having seen mothers switch with daughters, children become their older selves and even Nic Cage and John Travolta go at each other wearing the wrong skins, you’d think audiences had seen it all. Apparently, they’ve never seen an R-rated version. Bums will barely be on seats before The Change-Up telegraphs its intentions, one early scene ending with a mouth full of excrement. It would be nice to say it’s all uphill from there, given the talent involved. Director David Dobkin was responsible for the Wedding Crashers, while scribes Scott Moore and Jon Lucas wrote The Hangover. 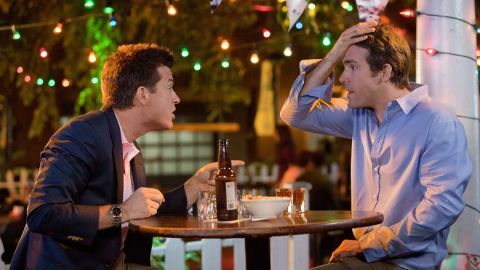 The pitch has potential: out-of-work actor Mitch (Ryan Reynolds) and workaholic Dave (Jason Bateman) have a quick slash in a magic fountain; the next day, they wake up in each other’s bodies. Sadly, somewhere along the line the scripters seemed to have swapped bodies with a couple of unsophisticated frat boys. The result is a sort of Mutha-Freakin’ Friday, where excessive F-bombs and enlarged body parts line up for your laughs. The Change-Up’s only saving graces come from Bateman and Reynolds, who at least bring that all-important ingredient: chemistry. It’s a treat to see Bateman play the foul-mouthed slacker, rather than his usual mild-mannered everyguy. Some slapstick moments – the norm for a body-swap flick, even one with Tourette’s – also entertain, but this is more dumb and crass than clever and filthy.